Deliberation in Citizens' Initiative Review processes is analytically rigorous, unbiased, and democratic. Citizens' Initiative Review statements are accurate, clear, and reliable, and are more readable than official explanatory statements. 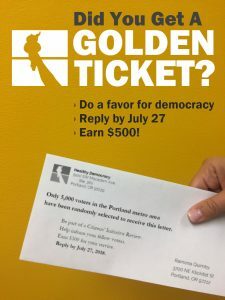 * Fun Fact: In Oregon, where the Citizens’ Initiative Review process is an official part of elections, more than 40% of voters who cast ballots reported reading the Citizens’ Statement when deciding how to vote! Evaluation is critical to ensuring that our processes are of high quality and that our work has real impact. Since 2008, every Citizens’ Initiative Review process has been studied by a team of university researchers. We are proud of our collaborations with researchers and are committed to doing our part to ensure a robust body of knowledge. Dr. John Gastil at The Pennsylvania State University and Dr. Katherine Knobloch at Colorado State University lead the Citizens’ Initiative Review Research Project. The Project has been funded by The Kettering Foundation, the National Science Foundation, and the Democracy Fund. The Project publishes reports on the quality and efficacy of Citizens’ Initiative Review processes, and also regularly publishes scholarly papers using the CIR as a model to study group dynamics, decision-making, cultural cognition, deliberation, and education. The Project’s reports provide us a unique and powerful feedback loop that we use to continuously improve Citizens’ Initiative Review processes and statements. In addition to scientific study, Healthy Democracy conducts internal evaluations with moderators and former panelists. This allows us to improve our partnership and project delivery practices. It also gives us yet another stream of feedback that we use to improve our Citizens’ Initiative Review process and materials. 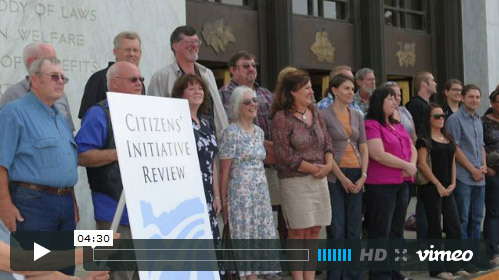 A huge part of our impact is putting Citizens' Initiative Review statements in the hands of voters. Just as important is telling the story of the Citizens' Initiative Review, and sharing the transformation potential of political deliberation across differences. 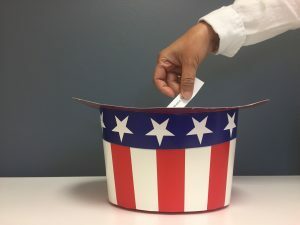 Ann Bakkensen and Marion Sharp, two participants in Healthy Democracy’s first CIR in Oregon in 2010, discuss experiencing deliberative democracy in action — and the unlikely friendship that resulted. "What Does a Healthy Democracy Look Like?" In addition to the formal research supporting the Citizens' Initiative Review as an important service to the voting public, the CIR has a powerful impact on the citizen panelists themselves. This has been a fantastic learning and growing experience. It helps people see each other as people and fellow citizens – not as the enemy or someone to be afraid of. It builds community, bridges differences and establishes an example of how we can reach out to each other – despite differences – to create hope, stimulate thought, and to discover our commonalities in the process of creating a better Oregon and maybe a better nation that we can all be proud of. I’m excited that this opportunity exists for a diverse group of people come together to share their thoughts. It makes me more optimistic about our democracy and more inspired to be a part of it. This is really, truly democracy in action. Twenty-four different mindsets; twenty-four different opinions – [yet] we all managed to wade through it and come out with a great product.